"The Shift" is a call to become more conscious, to move from aimless Ambition . . . to Meaning and purpose. Making this Shift is a necessity in order to live a peaceful, fulfilling life aligned with your Divine calling.In this deeply engaging live seminar, Dr. Wayne W. Dyer explains that instead of heeding the demands of the ego, which keep you mired in self-sabotage through never-ending pleas and false promises, you can choose to move in a new direction—one that leaves the false self behind so you can reclaim your true nature. The ego has driven many of us away from our authentic selves. In Making the Shift, Wayne reveals how we can make that all-important U-turn and head back to the Source of being that created us. 9. 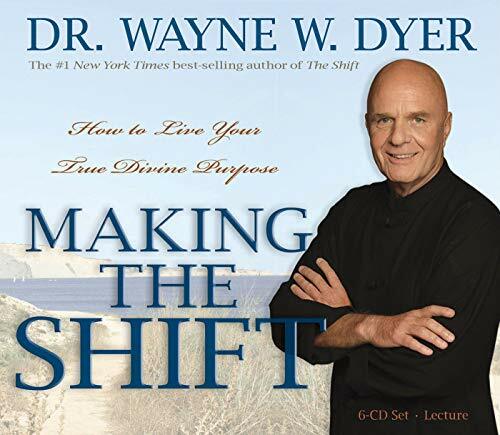 Making the Shift: How to Live Your True Divine Purpose [Audio CD] Dyer, Dr. Wayne W.